September 8, 2006, was the final day of the 21st European Photovoltaic Solar Energy Conference and Exhibition. 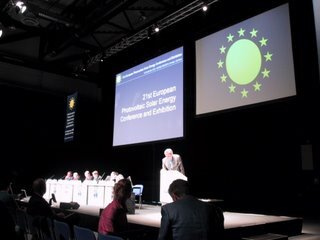 To my surprise, the exhibition portion of the 21st EU PVSEC finished on Thursday evening, and the stand teardown began with immediate haste. I would estimate the attendance for the final session on Friday dwindled down to about 500 to 600 attendees. Hans-Josef Fell, member of the German Parliament and winner of the John C. Bonda Award on Wednesday, gave the keynote address and linked global poverty, climate change, and energy security issues as problems to be solved together, not separately. Mr. Fell posited “Solar Energy is the Freedom Energy” and suggested leadership by example with developed countries adopting renewables and PV was the best way to counter veiled nuclear ambitions in Iran and other developing countries. Dr. Heinz Ossenbrink, the Technical Programme Chairman, presented 12 summary slides on the Conference highlights. There were 260 Plenaries/Oral and 840 Posters/Visual presentations. A handout for this summary was provided, but I am trying to get an electronic version. Either way, I will publish this summary in a follow up post. The final official numbers for the EU PVSEC were reviewed. There were 2649 delegates from 95 countries; Germany 38%, USA 9%, Japan 5%, Spain/Netherlands/France 4% were the top 5. 382 exhibitors from 29 countries packed the 1.6 Hectares at MESSE DRESDEN; Germany 57%, China 7%, USA 7%, Spain/Italy 4% were the top 5 exhibiting countries. I believe Asia and Japan were under represented at the exhibition. Poster Awards were presented for the best visual presentation in each of the eight conference topics. Technical, presentation, and an academic viewpoint were considered in the subjective judging of the posters. Here are the reference numbers and titles of the poster winners. Please check the Conference Programme for Visual presentations below for more details about author(s) and sponsoring companies or organizations. The 22nd EU PVSEC will be held in September 2007 in Bologna, Milan (Milano), or Lisbon (Lisboa).The EU PVSEC Conference Programme can be found online here; there is a separate PDF file for each day: Monday, Tuesday, Wednesday, Thursday, and Friday. Visual presentations are at Monday – Tuesday and Wednesday – Thursday. The Conference Proceedings on CD-ROM have been promised for delivery by the end of October (yes, they did say this October, 2006). If you are like me and can’t wait, use the conference program and check the company, research institution (example: Fraunhofer ISE), or organization websites directly or email the presenter, usually the first name on a co-authored paper. I don’t understand why the presentations can’t be placed on a server for download by attendees at the end of each day. Even if tweaked to the last minute, each presentation must be submitted to the conference audio/visual team in electronic form. This IS the twenty-first century and the Internet 2.0 age. Of course, a double standard exists for this blog, and tardy posts such as this one are acceptable.